How Much Does It Cost To Run An Aquarium? Before starting an aquarium in your home, it is important to consider your budget for not only the setup itself, but also for the electricity it will cost you per month. Electricity can be pricey for large tanks ranging around 100 gallons. If the cost of electricity is a worry for you, consider setting up a smaller tank, around 10 or 20 gallons. Here we will teach you how to calculate the electricity bill of your aquarium before setting it up. We will provide examples of the costs of typical 10 gallon, 30 gallon, 50 gallon, and 100 gallon fish tanks for easy reference. Lastly, we will give some tips on how to save electricity and lower your aquarium electric bill. To calculate the cost of your monthly electric bill for your home aquarium, simply read the wattage labels on each piece of equipment. This will be the cost per month to run your aquarium heaters, filters, lights, protein skimmers, and phosphate reactors. Now, to find the cost of electricity per month of each item, take the wattage and multiply it by the number of hours it is turned on in a day. For heaters, assume it is on around 15 minutes per hour. Lights should be on for between 10 and 12 hours per day. Filters are assumed on full-time to keep your aquarium clean and healthy for your fish. Next, multiply this number of watts per day by how many days are in the month, 30 on average. This will be how many watts the particular item uses per month. Divide this number by 1000 to equate it into kilowatts. Where I live my electric company charges 12 cents per kilowatt. This means if my filter takes 2 kilowatts per month, it will cost me 24 cents to run each month. To find the total cost of running your fish tank, calculate the cost for each item that takes electricity and runs. Lights: 5 to 30 watts depending upon the use: the first for observing fish, or the latter for maintaining plants or coral. Heater 24 hours per day times 1/4 each hour it is on = 6 hours on per day. 6 hours times 50 watts = 300 watts per day. 300 watts times 30 days = 9000 watts. 9000 watts divided by 1000 watts per kilowatt = 9 kilowatts per month. 9 kilowatts times 12 cents per kilowatt = $1.08 dollars per month to run 10 gallon 50 watt aquarium heater. Lights On an average of 11 hours per day. 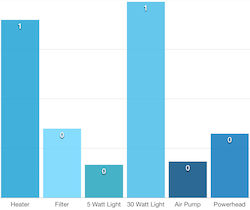 For fish only: 5 watt light: 11 hours times 5 watts = 55 watts per day. 55 watts per day times 30 days = 1,650 watts per month. 1,650 watts divided by 1000 watts for 1 kilowatt = 1.65 kilowatts per month. 1.65 kilowatts per month times 12 cents per kilowatt = $0.20 cents per month to run fish only freshwater light. For 30 watt light maintaining plants or coral: 11 hours per day times 30 watts = 330 watts per day. 330 watts per day times 30 days = 9,900 watts per month. 9,900 watts per month divided by 1000 watts per kilowatt = 9.9 kilowatts per month. 9.9 kilowatts per month times 12 cents per kilowatt = $1.19 dollars per month to run light for 10 gallon tank supporting plants or coral. Filter On 24 hours per day to keep tank clean. 24 hours per day times 5 watts = 120 watts per day. 120 watts per day times 30 days = 3,600 watts per month. 3,600 watts per month divided by 1000 watts per kilowatt = 3.6 watts per month. 3.6 watts per month times 12 cents per watt = $0.42 cents per month to run your 10 gallon aquarium filter. Air Pump On all day for oxygen in your fish tank. 2.5 watts times 24 hours per day on = 60 watts per day. 60 watts per day times 30 days = 1,800 watts per month. 1,800 watts per month divided by 1000 watts per kilowatt = 1.8 kilowatts per month. 1.8 kilowatts per month times 12 cents per kilowatt = $0.22 cents per month to run your 10 gallon air pump for oxygen in your fish tank. Powerhead On 24 hours per day for oxygen in your fish tank. 4.5 watts times 24 hours per day = 108 watts per day. 108 watts per day times 30 days per month = 3,240 watts per month. 3,240 watts divided by 1000 watts per kilowatt = 3.24 kilowatts per month. 3.24 kilowatts times 12 cents per kilowatt = $0.39 cents per month to run your powerhead for your nano 10 gallon aquarium. The total electric cost of running a 10 gallon aquarium per month, as estimated above, is $1.92 dollars, $23.04 annually, for a 10 gallon freshwater fish tank with no live plants, or $3.08 dollars, $36.96 annually, for a 10 gallon saltwater fish tank supporting live plants or coral. This tank size is cheapest and great for people with a small budget. The 10 gallon tank size is also the most inexpensive to setup, as less strong lights and heaters cost less than stronger counterparts. 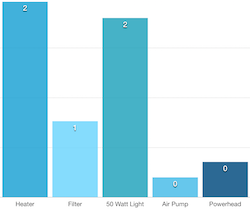 Lights: 50 watts on average for plants or coral. Heater 24 hours per day times 1/4 each hour it is on = 6 hours on per day. 6 hours times 100 watts = 600 watts per day. 600 watts times 30 days = 18,000 watts. 18,000 watts divided by 1000watts per kilowatt = 18 kilowatts per month. 18 kilowatts times 12 cents per kilowatt = $2.16 dollars per month to run a 30 gallon 100 watt aquarium heater. Lights On an average of 11 hours per day. 11 hours times 50 watts = 550 watts per day. 550 watts per day times 30 days = 16,500 watts per month. 16,500 watts divided by 1000 watts for 1 kilowatt = 16.5 kilowatts per month. 16.5 kilowatts per month times 12 cents per kilowatt = $1.98 dollars per month to run 30 gallon fish tank supporting live plants or coral. Filter On 24 hours per day to keep tank clean. 24 hours per day times 10 watts = 240 watts per day. 240 watts per day times 30 days = 7,200 watts per month. 7,200 watts per month divided by 1000 watts per kilowatt = 7.2 watts per month. 7.2 watts per month times 12 cents per watt = $0.84 cents per month to run your 30 gallon aquarium filter. Air Pump On all day for oxygen in your fish tank. 2.5 watts times 24 hours per day on = 60 watts per day. 60 watts per day times 30 days = 1,800 watts per month. 1,800 watts per month divided by 1000 watts per kilowatt = 1.8 kilowatts per month. 1.8 kilowatts per month times 12 cents per kilowatt = $0.22 cents per month to run your 30 gallon air pump for oxygen in your fish tank. Powerhead On 24 hours per day for oxygen in your fish tank. 4.5 watts times 24 hours per day = 108 watts per day. 108 watts per day times 30 days per month = 3,240 watts per month. 3,240 watts divided by 1000 watts per kilowatt = 3.24 kilowatts per month. 3.24 kilowatts times 12 cents per kilowatt = $0.39 cents per month to run your powerhead for your 30 gallon aquarium. The total electric cost of running a 30 gallon aquarium per month, as estimated above, is $5.37 dollars for a 30 gallon fish tank supporting live plants or coral. The 30 gallon tank electric bill amounts to $64.44 dollars per year.This tank size is still inexpensive for people with a smaller budget. The 30 gallon tank size is also fairly cheap to setup, as equipment under 50 gallons is generally decently priced. 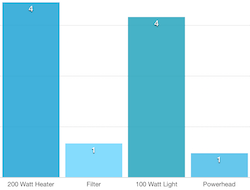 Lights: 100 watts on average for plants or coral. Heater 24 hours per day times 1/4 each hour it is on = 6 hours on per day. 6 hours times 200 watts = 1,200 watts per day. 1,200 watts times 30 days = 36,000 watts. 36,000 watts divided by 1000 watts per kilowatt = 36 kilowatts per month. 36 kilowatts times 12 cents per kilowatt = $4.32 dollars per month to run a 50 gallon 200 watt aquarium heater. Lights On an average of 11 hours per day. 11 hours times 100 watts = 1,100 watts per day. 1,100 watts per day times 30 days = 33,000 watts per month. 33,000 watts divided by 1000 watts for 1 kilowatt = 33 kilowatts per month. 33 kilowatts per month times 12 cents per kilowatt = $3.96 dollars per month to run 50 gallon fish tank supporting live plants or coral. Filter On 24 hours per day to keep tank clean. 24 hours per day times 10 watts = 240 watts per day. 240 watts per day times 30 days = 7,200 watts per month. 7,200 watts per month divided by 1000 watts per kilowatt = 7.2 watts per month. 7.2 watts per month times 12 cents per watt = $0.84 cents per month to run your 50 gallon aquarium filter. Powerhead On 24 hours per day for oxygen in your fish tank. 7 watts times 24 hours per day = 168 watts per day. 168 watts per day times 30 days per month = 5,040 watts per month. 5,040 watts divided by 1000 watts per kilowatt = 5.04 kilowatts per month. 5.04 kilowatts times 12 cents per kilowatt = $0.60 cents per month to run your powerhead for your 50 gallon aquarium powerhead. The total electric cost of running a 50 gallon aquarium with live plants or coral is $9.72 dollars per month. This price amounts to $116.64 annually. The 50 gallon tank size is decently priced for people with a smaller budget. The 50 gallon tank size is slightly expensive as the equipment needs to be fairly strong to keep 50 gallons of water warm, and for your lights to penetrate the larger, deeper aquarium. Lights: 200 watts on average for plants or coral. Heater 24 hours per day times 1/4 each hour it is on = 6 hours on per day. 6 hours times 400 watts = 2,400 watts per day. 2,400 watts times 30 days = 72,000 watts. 72,000 watts divided by 1000 watts per kilowatt = 72 kilowatts per month. 72 kilowatts times 12 cents per kilowatt = $8.64 dollars per month to run a 100 gallon 400 watt aquarium heater. Lights On an average of 11 hours per day. 11 hours times 200 watts = 2,200 watts per day. 2,200 watts per day times 30 days = 66,000 watts per month. 66,000 watts divided by 1000 watts for 1 kilowatt = 66 kilowatts per month. 66 kilowatts per month times 12 cents per kilowatt = $7.92 dollars per month to run 100 gallon fish tank supporting live plants or coral. Filter On 24 hours per day to keep tank clean. 24 hours per day times 10 watts = 240 watts per day. 240 watts per day times 30 days = 7,200 watts per month. 7,200 watts per month divided by 1000 watts per kilowatt = 7.2 watts per month. 7.2 watts per month times 12 cents per watt = $0.84 cents per month to run your 100 gallon aquarium filter. Powerhead On 24 hours per day for oxygen in your fish tank. 10 watts times 24 hours per day = 240 watts per day. 240 watts per day times 30 days per month = 7,200 watts per month. 7,200 watts divided by 1000 watts per kilowatt = 7.2 kilowatts per month. 7.2 kilowatts times 12 cents per kilowatt = $0.86 cents per month to run your powerhead for your 100 gallon aquarium powerhead. The total electric cost of running a 100 gallon aquarium with live plants and coral is $18.26 dollars per month. This means the aquarium electric expense is $219.12 annually. This tank size may be a bit much for someone will a small budget. The 100 gallon tank size is also expensive to setup as the equipment needs to be very strong to keep 100 gallons of water warm, and for your lights to penetrate the large aquarium. Usually it takes above $1,000 to buy all necessary equipment to setup this size tank, which may be too pricey depending upon your situation. Many fish preferences have a range, for example, between 70 and 80 degrees fahrenheit. To save money, simply adjust your heater to the low end of the spectrum. This means your heater will run much less because it is not constantly trying to hold a higher temperature. If your house is hot, maybe turn your air condtioner to 80 degrees so that the heater almost never has to run because the tank is already the correct temperature. This way your air conditioner should cost less too. This entry was posted in General Information on April 13, 2018 by Joshua@themandaringarden. Since you asked I went ahead and ran the numbers for you. If I found the right cost of electricity in Camden, which I found to be 15.78 cents per kilowatt hour, The the cost per month is as follows. For a year of operation you would be looking at around $255. maybe closer to $280 as it is cooler there. This is for a tank with fairly strong water flow and a light that can support corals. A weaker light would cut the cost down a good amount if you are going to do a fish only with live rock tank. Feel free to ask any more questions. I hope I didn’t answer you too slowly! I was on a two month vacation. Hey April, Not sure how I didn’t see your comment sooner. Sorry about that. Total $9.98 a Month for a 60 gallon tank with corals. This is even giving a bit of high value to the Lights. If you live in a cold house or get a tall tank with a much stronger light you could possibly reach $12.50 a month but I really doubt it. I hope you come back and read this. Again sorry for the late reply. Hi there! I enjoyed reading this thank you. I am however confused and perhaps I’m reading it wrong but for heater cost shouldn’t it be calculating 24hrs a day use not 6 hours? I just bought an 800w heater for my 200g pond and will be running it starting in November most likely. I’m in California. What’s a realistic price per month estimate for this as it’ll be on 24 hours a day not 6. My lights on my aquariums are on 6 hours a day only but their heaters are all on 24 hours for a consistent temperature… thanks so much. Hey Jessica, I suppose that’s something I should have addressed. These costs are for indoor tanks where the heater just kicks on every once and awhile. 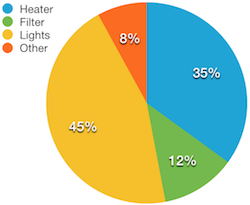 unless you keep your home super cold you probably won’t need the heater on 24 hours a day. This cost assumes the heater is on all month, which it could be for the colder months. The rest of the cost depends on what you use for the pond. It could be really low if it only needs to be heated but if you filter it and provide water flow the cost could be higher. 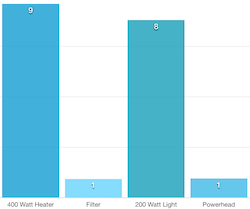 Add in $2 a month for power heads and you have $82.48 a month, with just over 80% of the cost being the 800w heater.